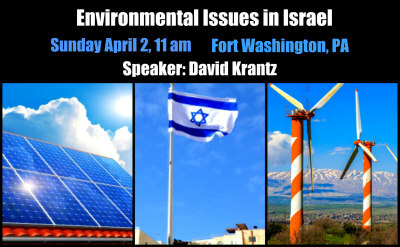 The Third Annual Barbara Siegel Memorial Israel Program will be on Sunday, April 2 at 11:00 am at Congregation Or Hadash in Fort Washington, PA.
Our speaker, David Krantz, is a National Science Foundation IGERT Fellow and a Wrigley Fellow researching solar-energy policy and faith-based environmentalism. Free and open to the public. A dairy lunch will be included.